Rome 174AD. As the war continues in the north Marcus Aurelius orders Gaius Maximus and Rufus Atticus to return to Rome. Enemies lurk in the shadows in the capital, spreading propaganda and sowing dissent. The praetorian guards must lure their enemies out – and defeat them. Yet Maximus is returning home for something, or rather someone, else: Aurelia. The soldier will be caught between his duty and his happiness. Rufus Atticus will also be forced to make a choice, between the duty he owes to his Emperor and the duty he owes to his family. Triumph and tragedy may prove to be two sides of the same coin. The centurions will be caught-up in a web of intrigue – as well as a battle on the streets of Rome – that will decide the fate of Marcus Aurelius and the Empire. ‘Sword of Empire: Centurion’ is the sequel to the best-selling novella ‘Sword of Empire: Praetorian’. For fans of Simon Scarrow, Harry Sidebottom and Conn Iggulden. Richard Foreman’s books have been widely praised. Praise for ‘Augustus: Son of Rome’. ‘Augustus: Son of Rome forges action and adventure with politics and philosophy. This superb story is drenched in both blood and wisdom – and puts Foreman on the map as the coming man of historical fiction’. – Saul David, Author of the Zulu Hart series. Praise for Raffles: The Complete Innings. “Classy, humorous and surprisingly touching tales of cricket, friendship and crime.” – David Blackburn, The Spectator. 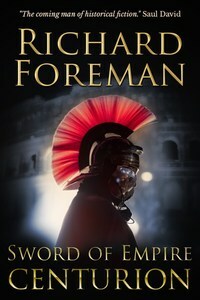 Richard Foreman is the author of numerous best-selling books, including ‘Augustus: Son of Rome’ and the Sword of Rome series of historical novellas. He is also the author of ‘Warsaw’, a literary novel set during the Second World War. He lives in London. You can find him tweeting at @rforemanauthor. Endeavour Press is the UK’s leading independent publisher of digital books.